Autumn Beachy Books School Book Club Launches! Beachy Books is happy to announce that we are becoming a bookseller and will now be selling the latest published children’s books alongside our own children’s books, direct to primary schools with our new Beachy Books School Book Club! Every term we select over 50 children’s books to suit all primary school ages at great discounts from 10-40%! They range from the latest fiction bestsellers to exciting non-fiction and fiction that tie in with the school curriculum. We know there are lots of places you can buy books but what makes us different is that the more books that children and parents buy from our book club, the more FREE books we supply to your school library! If you want your school to take part please get in contact by emailing schoolbookclub (at) beachybooks (dot) com. At present the scheme is only running for UK schools on the Isle of Wight but we do hope to expand it out to other mainland schools if there is demand. 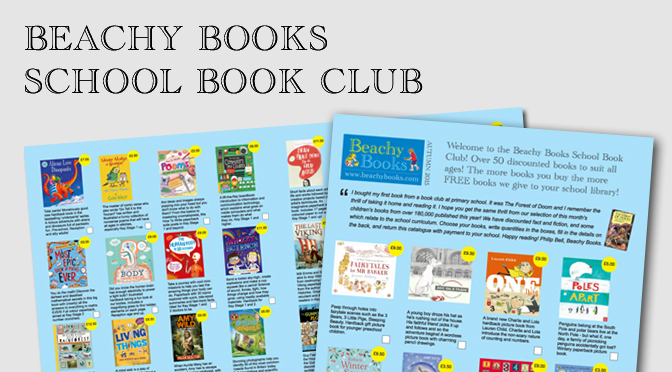 To view our latest Beachy Books School Book List catalogue click here or see the School Book Club menu at the top of our website. Previous PostPrevious Beachy Books publishes your books! Next PostNext Your Journey Starts Here… again!